Reverend Benjamin O’Rorke was a Church of England army chaplain. Interestingly he had been commissioned in 1901 and had accompanied troops in the South Africa campaign. At the outbreak of the First World War he was quickly sent to France, but was captured as Landrecies on 26th August 1914 whilst serving with the Field Ambulance. As the British Expeditionary Force withdrew, he stayed with the wounded. Although now a Prisoner of War, he expected to be released under terms of Geneva Convention as a non-combatant, but remained a prisoner. He was eventually repatriated in summer 1915 as part of an exchange, but was reluctant to leave the other prisoners. Upon his return he rejoined the forces in the Headquarters of the Church of England Army chaplaincy, was awarded the Distinguished Service Order on 1st January 1917, and where he served until June 1918. Posted back to England, he died of pneumonia on Christmas Day 1918. The book itself is split into several parts. 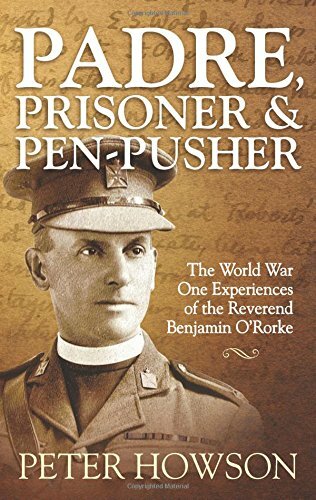 There is a detailed look at his examination of O’Rorke’s life and ministry, and his theology based on surviving sermons. The overview of his wartime experiences is concise but contains plenty of detail. There is also a look at chaplains’ view of the post-war world based on contemporary documents, and a general overview of diaries as a source about chaplains (including where they are held and what they contain). This is supplemented by an annotated bibliography. A separate section provides the edited transcript of O’Rorke’s diary from January to June 1918. This is quite disjointed, in that it is not a ‘narrative’ diary but rather provides details of his movements and, activities, and conversations. An appendix lists summary details about the chaplains and others mentioned in the diary. Whilst quite specialist in its focus, this well-researched volume is bound to appeal to anyone with an interest in the organisation and work of chaplains during the war.